Join MAA on a winter ascent of Matterhorn Peak. 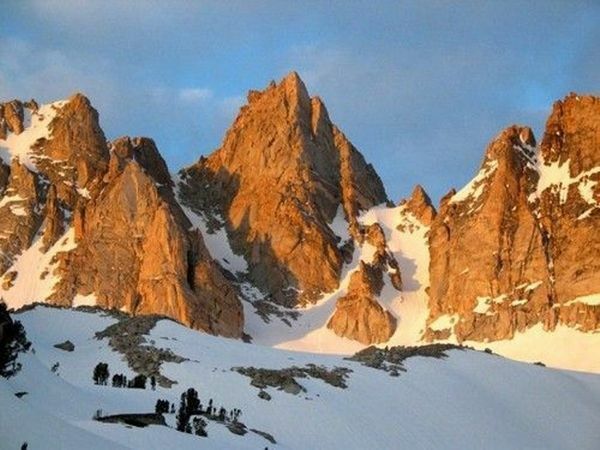 This sharp granite peak is the king of the Sawtooth Range featuring a long couloir that leads to the summit spine. Proficiency in winter camping and climbing is required. Loaner gear may be available. We have room for 8. Hope to have you out with us! What's happening: Matterhorn Peak, 12,279, East Couloir route, Class 3, snow up to 45 degrees. Multi-day ascent, winter camping, off trail navigation. TH is at Twin Lakes at 7,000'. Approach is about 4 miles and gains about 3,000'. Will push higher if possible. Where to meet: At the entrance to Annette's Mono Village Resort at 9:00 a.m. near Bridgeport Ca. Take the Twin Lakes road to the end. What to bring: Warm, stormproof layers for upper and lower body - 4 layers for upper and 3 layers for lower, minimum. 2 pair socks and gloves, warm mittens, warm headwear, sunglasses, goggles, gaiters, helmet, warm mountain boots, sharp steel crampons fit to your boots, ice axe, food for 2 nights / 3 days, waterbottles with insulating sleeve, spoon, cup, warm sleeping bag, sleeping pads, trekking pole(s), snowshoes or skis, snow shovel. Equipment such as stove, pots, fuel and tents may be supplied by MAA. Bring what you have of these items and we'll select the group gear. Leave about 10 liters of space and up to 5 lbs for group gear. Additional Info: We'll be parking on the road outside the resort if the gates are not open. If we park in the resort, there may be a $10 fee. DAY 1: Friday March 15th - Meet at the entrance to Annette's Mono Village Resort at the end of Twin Lakes Road in Bridgeport, CA. Take care of gear, logistics. Walk to the TH and make the approx. 5 mile approach on snowshoes or skis, and establish basecamp near the base of Matterhorn Peak at about 10,600. DAY 2: Saturday, March 16th - With an early start, ascend snow up the East Couloir to the summit spine, then scramble Class 3 rock to the summit. Descend to return to basecamp. DAY 3: Sunday, March 17th - Take down camp and return to the trailhead. Drive home.